There are studies being performed in universities all over the world that help us to learn more about health and illness in our pet cats. The results of these studies can show veterinarians how to manage disease better, and also how to prevent it. The American College of Veterinary Internal Medicine Forum for 2012 was held in New Orleans and featured a lecture by Australian veterinarian Dr Jacquie Rand. This lecture is an excellent example of how research can help to keep our cats healthy and avoid serious and debilitating disease. Dr Rand is an internationally recognized leader in research into diabetes management in cats, and her lecture was titled The Pre-diabetic State in Cats. Cats can have a pre-diabetic state where they have fairly high blood glucose levels, up to 200 mg/dl (11 mmol/L), but show no symptoms of the disease. These cats don’t need insulin but do need some lifestyle changes. If your cat’s blood glucose levels are at this level, then you should start a weight loss program and change his diet to a low carbohydrate food. This will help to prevent him developing full blown diabetes. Up to 90% of diabetic cats will achieve remission with appropriate management and this remission can occur within 4-6 weeks of treatment being started. 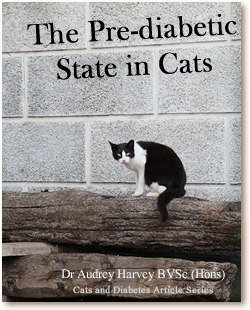 Diabetic cats are best managed with both insulin and a change in diet. If a cat has an underlying disease, then he isn’t as likely to achieve remission. High blood glucose is toxic to pancreatic beta cells and damage to these cells can occur within a week. If diabetes or pre-diabetes is diagnosed early and managed properly with insulin and/or dietary modification, then remission is more likely. Canned diets are the best choice for diabetic cats, and ideally they should be less than 12% carbohydrate. This gives you the best chance of regulating your cat’s diabetes. If he is fed a canned food from a young age, and his weight is kept under control, he is less likely to develop diabetes as an adult. Dr Rand tends not to be too concerned about fructosamine levels, but instead prefers to take serial blood glucose levels. There are metabolic changes in both kidney disease and diabetes that make it more likely that a cat with one of these diseases will develop the other. Diabetes itself will cause kidney problems, and kidney disease can cause insulin resistance. If your cat has both diseases, then their diet should be aimed at managing the kidney disease and then his insulin dose can be worked out from there. The most important message from this conference’s lecture on diabetes in cats is that we need to intervene early, and catch these cats before they become full blown diabetics. Any cat approaching middle age should have a quick blood glucose test performed each time they visit the veterinarian. If they are pre-diabetic, steps can then be taken to stop them developing the disease.